I saw six old friends during the St. Mary sesquicentennial celebration last week, and I’m ashamed to admit I had forgotten all about them. Every Sunday morning, I looked at them, thought how beautiful and reverent they were, and was fascinated by what they held in their hands. The frescoed angels flanki ng the reredos behind St. Mary’s altar fostered my appreciation for the beauty of sacred art and the symbolic meanings that it conveys. Other magnificent works I’ve beheld during my travels, like Angelic Salutation, Veit Stoss’s giant limewood sculpture of the Annunciation that hangs in the Church of St. Lorenz in Nuremberg, Germany, have raised my awareness of the importance of preserving and restoring these sacred artifacts. Seeing Father Kevin Lutz standing before my six angelic friends prompted me to accomplish something I’ve been meaning to do for years. I made a long-overdue pilgrimage to the Jubilee Museum. Father Lutz founded this very special place in 1998, when Bishop James Griffin encouraged parish pastors in the Roman Catholic Diocese of Columbus to commemorate the Jubilee Year of 2000 in some way. Lutz, then the pastor of Holy Family Catholic Church in the Franklinton neighborhood of Columbus, chose to display some items illustrating Diocesan history in the upstairs rooms of the nearby building that housed Holy Family Soup Kitchen, previously the home of Holy Family High School. As word spread about the exhibit, people like my cousin, Monsignor Lawrence Corcoran, began contributing more items. 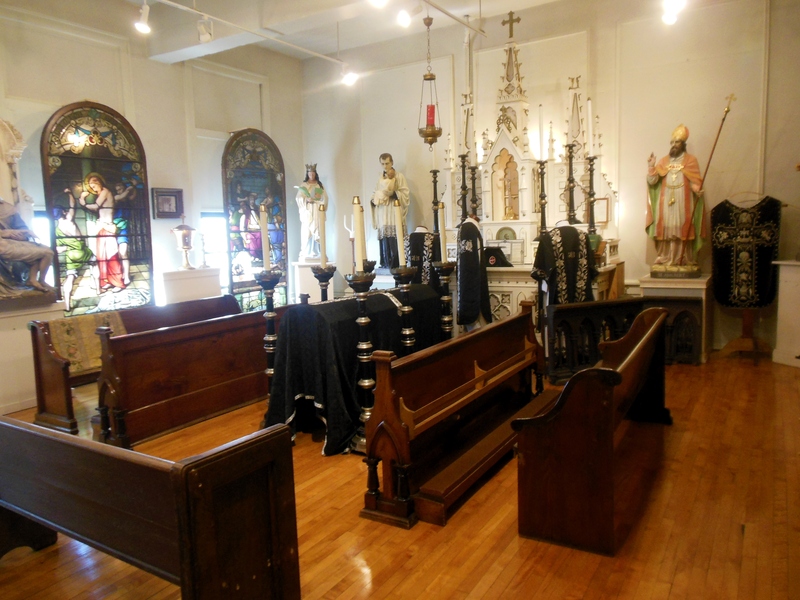 Before long, it became a museum on a mission to preserve sacred art, restore liturgical items to sacred use, and share the Catholic heritage through those items. Today, the Jubilee Museum holds the largest collection of Catholic artwork in the United States. 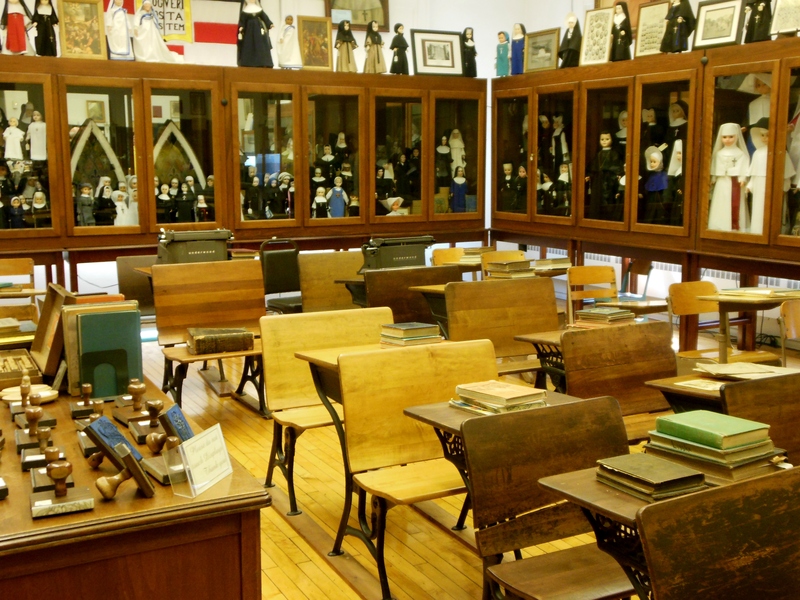 Former classrooms and assembly rooms comprise the galleries displaying an incredible array of altars, statues, paintings, crucifixes, stained glass windows, Eucharistic vessels, relics of the Saints, reliquaries, manuscripts, organs, school uniforms, ancient artifacts from the Holy Land, the libraries of deceased bishops and priests, and more. One room dedicated to the Semitic roots of Catholic worship displays items important to the Jewish faith, like an Ark and a Torah. Another showcases the history and legacy of the traditional Latin Mass. 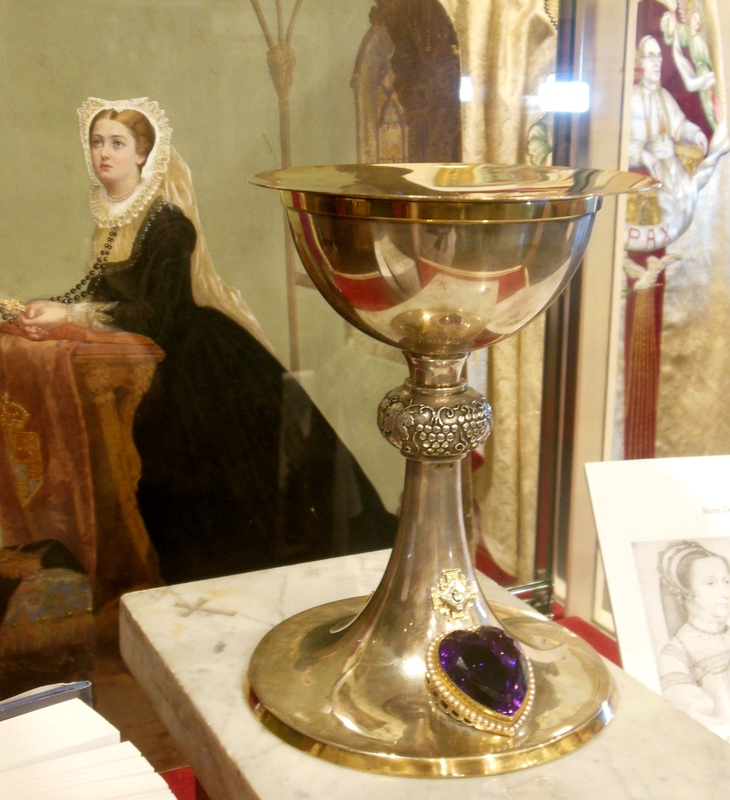 The museum’s collec tion contains 300 altar missals spanning a 400-year period, including those used for the Latin Mass, at funerals, for various events like the dedication of a church, and for exclusive use by religious orders. 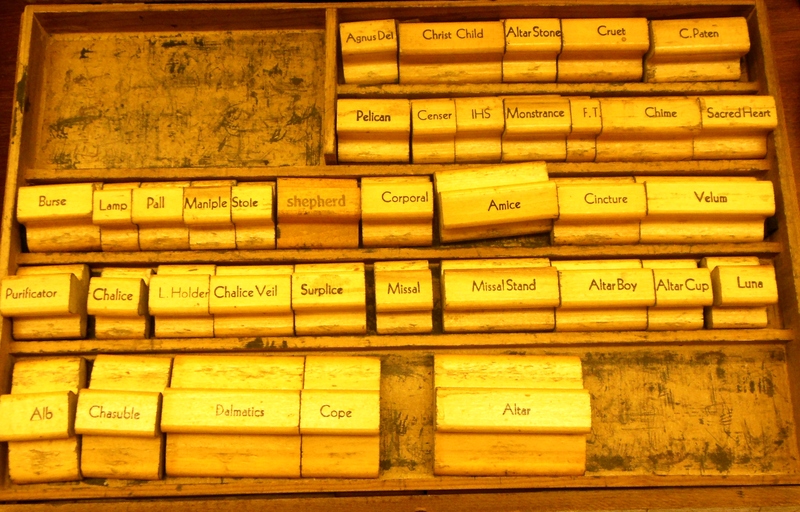 Bibles in over a dozen languages, including Braille, are represented, with the oldest English-language Bible being a first-edition Rheims New Testament from 1582.
where I tested my knowledge of Catholic vocabulary words with a nifty set of rubber stamps. 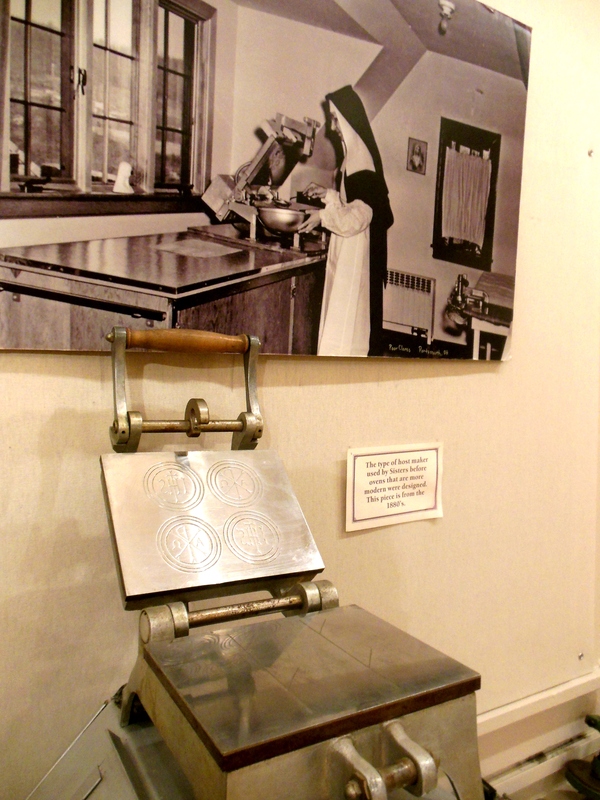 In another room honoring the teaching orders of nuns, I discovered how hosts used to be made. 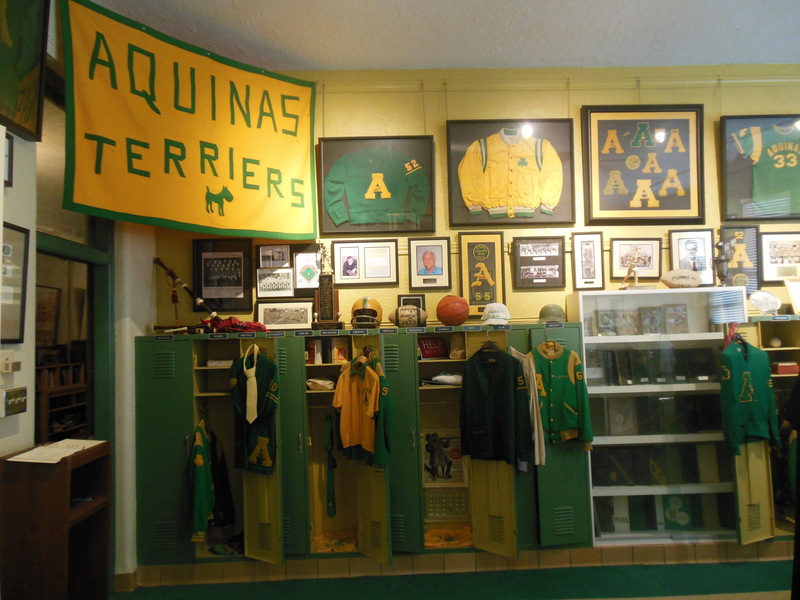 Other rooms celebrate the local legacies of St. Joseph Academy and Aquinas High School, both long closed but not forgotten by their graduates. 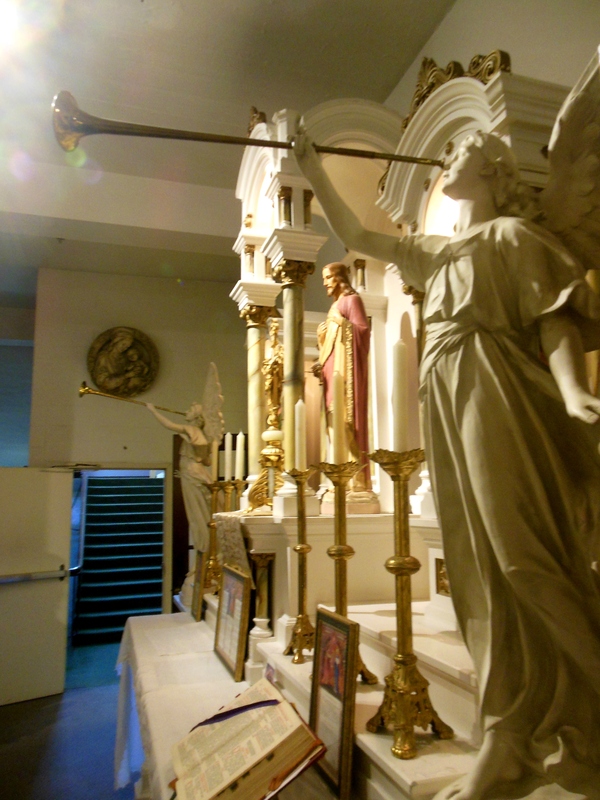 Tour the museum however you like, but save the St. Peter Room for last. This room is dedicated to St. Peter’s Church, which was built in 1928 on New York Avenue in the Milo-Grogan neighborhood of Columbus. The interior of the church was designed by Rambusch Studios of New York, which also designed many elaborate movie palaces of the day, while the A. J. Musselman Co. installed the church’s striking ceiling and interior plasterwork at about the same time it was putting in the ceiling at the Ohio Theatre. The church was closed and demolished in 1970; a Wendy’s restaurant and parking lot now stand on the site. When he was a teenager, Father Lutz played the organ for Sunday and weekday Masses at St. Peter’s from 1965 until the church was closed. Recovering artifacts from St. Peter’s is one of his special causes. Father Lutz has reunited several of the church’s stained-glass windows, portions of the altar, pews, pulpit, baptismal font, sanctuary lamp, benches, statues and Stations of the Cross. Many personal items belonging to Monsignor Anthony Schlernitzauer, the priest who served the St. Peter’s congregation from 1925 until the church’s closing, are on display, including a copy of The Joy of Cooking, his traditional gift to newlyweds. Two of the bronze bells that rang from the church tower were donated by the new St. Peter’s Church on Smoky Row Road. The third and smallest bell was stolen just before the church’s demolition was completed, and is still missing. Father Lutz is offering a $3,000 reward for it. 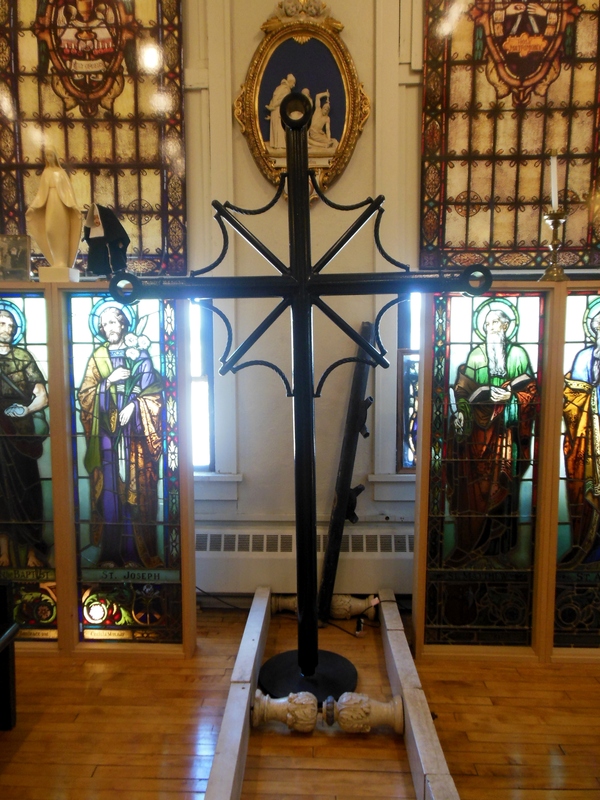 A cross built from pieces of the crane that was used to tear down St. Peter’s is now the symbol of the museum. 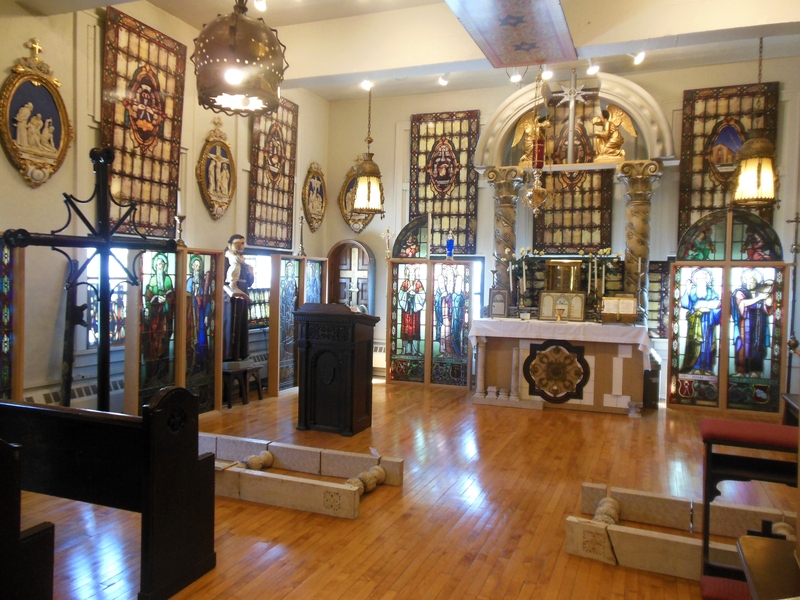 The museum also promotes the faith through rotating art exhibits and providing liturgical items like altars and statues for priests and parishes to use. It also supplied props for “I Am Wrath,” the movie that John Travolta filmed in Columbus earlier this year. Although it’s as unassuming as its location, the museum has attracted international attention. Most notably, Father Lutz’s work earned him the honor of being the first American appointed as a consultant to the Pontifical Commission for the Cultural Heritage of the Catholic Church. With a museum like this to his credit, Father Lutz is understandably obsessed with bringing faith-filled artifacts into his flock. If you come across something interesting at a garage sale or antique sale, or see anything that looks like it ever belonged to a Catholic church, please rescue it and let Father Lutz and the Jubilee Museum staff know. To learn more about the Jubilee Museum, tune in to its videos on its YouTube channel, watch Father Lutz’s January 26, 2011 appearance on the EWTN Global Catholic Television Network and make a donation to tour the museum. Follow the museum’s Facebook page to learn ab out special events and fundraisers. I attended its “Treasures New & Old” banquet on the recommendation of Father Lutz’s cat, Raphael, a published author who gives away Kit-Kat bars as prizes in poetry contests and writes a weekly column in the St. Mary bulletin. Raphael’s namesake is the subject of a window at the museum. Study this detail and let me know (1) why the archangel and saint is holding a fish and (2) what’s miraculous about this particular depiction of him doing so. That’s the value of religious art…and the Jubilee Museum. 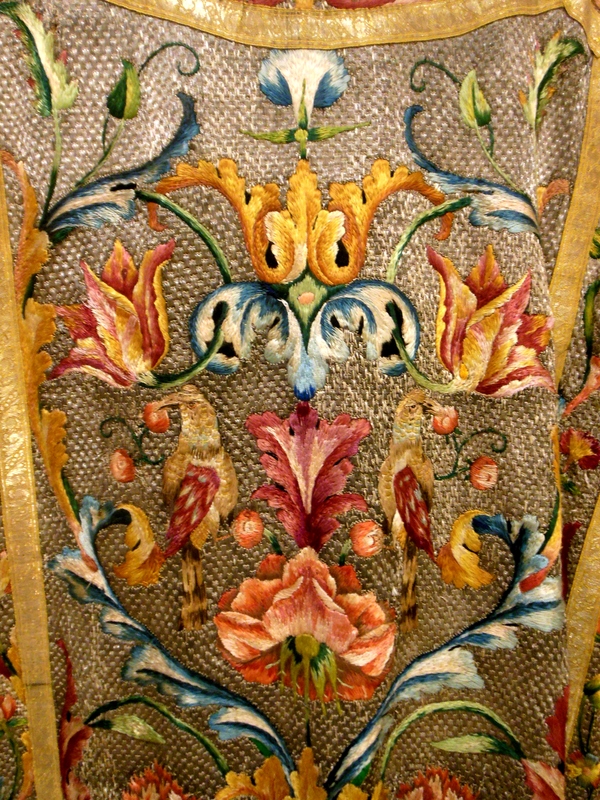 This entry was posted in Art, Churches, Columbus, History, Museums. Bookmark the permalink. I happened upon this blog and I want to offer you a big thank you for posting the photos of the nun doll collection. I donated my entire collection to the museum some years back when I realized it was time to let them go where they could be admired and appreciated. I have not been able to visit the Jubilee museum and see the display so it was such a thrill to see this photo of all my many familiar friends and how well they have been maintained. 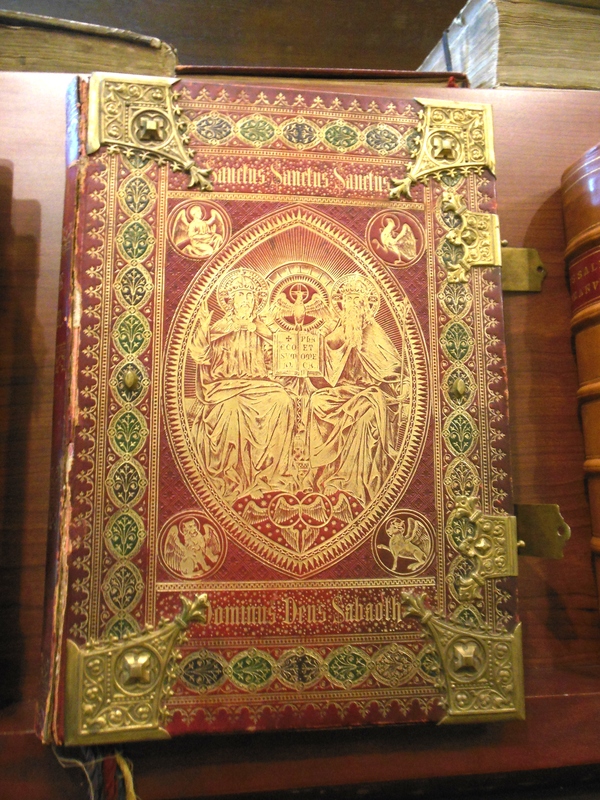 My collection was extensive and included many of the Catholic Orders and even a few Anglican communities. It gives me great joy to know that my beloved Sister dolls are in a safe place where others can see them and the history of these amazing women will remain as a reminder of their contribution to the faith.